Set to be released in January 2019, Wrapped Bitcoin Tokens are creating waves in the crypto community. Known as WBTC, this exciting development sets out to integrate Bitcoin into the Ethereum blockchain. Aren’t Ethereum and Bitcoin meant to be separate? It’s an exciting time for the crypto space, as a new Bitcoin token is on the horizon. Known as the Wrapped Bitcoin Token or WBTC, this new technology will allow Bitcoin technology to be compatible with the Ethereum network. WBTC involves creating a token that is backed by the value of Bitcoin. This can then be traded across other networks. What that means is that for each WBTC minted into existence, there is an equivalent amount of Bitcoin held in custody in a 1:1 ratio — it is fully backed. The same article describes WBTC as “a community focused initiative”. As a result, many in the crypto space are already jumping on board. This includes the likes of Maker, Dharma and AirSwap who, alongside 9 others, hope to launch the project in January next year. With its release date still a few months off, it is difficult to tell what WBTC will actually involve. At this stage, the crypto community is relying on the token’s whitepaper and temporary landing page to decide what this will mean for Bitcoin. According to these resources, WBTC will allow smart contracts and atomic swaps to be integrated into bitcoin. Put simply, the WBTC sets to increase bitcoin transaction speeds. Considering the hype and anticipation around the Lightning Network, WBTC will offer an alternative way to speed up bitcoin transactions. 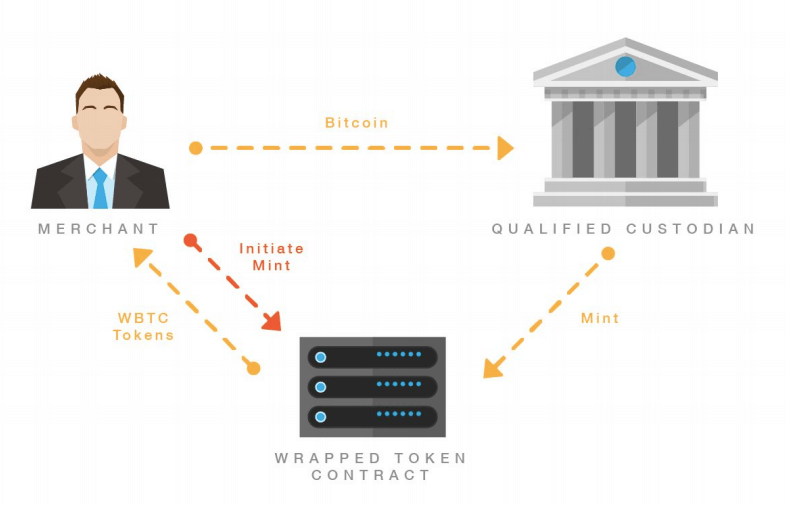 The WBTC minting process. Source: WBTC Whitepaper. The wrapped framework would make it easy to represent any other cryptocurrency, such as Bitcoin, on Ethereum and thereby enhance it with all the capabilities of the Ethereum blockchain. Previous articleDo Japan’s New Regulations Signal the Death of Crypto Scams?